Following a wave of strikes, the South Korean government has unleashed a massive attack against the Korean Metal Workers' Union targeting more than 75 of the union's key leaders for arrest or investigation. With the recent arrest of Hyundai Motor Branch First Vice-President Kim Tae-gon on September 16 and the arraignment of Jung Gab-deuk, president of the Korean Metal Workers' Union (KMWU), on September 18 on charges of obstructing business, members of the KMWU are bracing for more assaults. 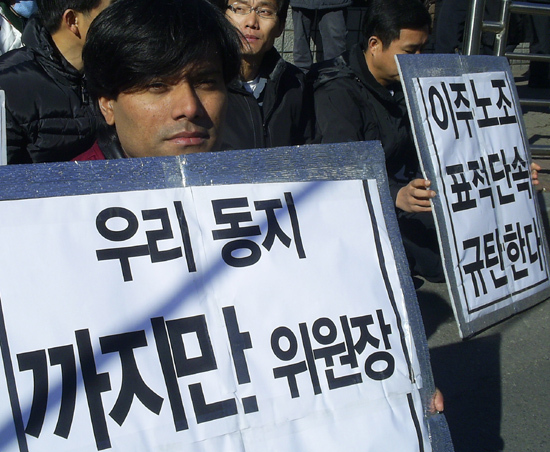 Leaders of the Korean Confederation of Trade Unions have also been targets of arrest. Arrest warrants were issued on July 24 for KMWU President Jung Gab-deuk, KMWU Vice-President Nam Taek-gyu, KCTU President Lee Suk-haeng, KCTU First Vice-president Jin Young-ok, KCTU General Secretary Lee Yong-shik, and all six of the top elected officers of the Hyundai Motor Branch namely; Yoon Hae-mo, Kim Tae-gon, Kim Jong-il, Jung Chang-bong, Joo In-koo, and Jo Chang-min. Search warrants were also issued for their homes. Reports from KMWU indicate that Vice-President Nam Taek-gyu and the remaining five Hyundai Motor Branch elected officers are currently in hiding, while another 70 of KMWU's national, regional and local leaders are targeted for investigation. KMWU President Jung Gab-deuk has been held at Youngdeungo Detention Center since his arrest on August 20. On July 27, KCTU First Vice-President Jin Young-ok was arrested and held before being released on bail in the first week of September. Meanwhile, police forces have surrounded the building where KMWU headquarters and the headquarters of the KCTU are located. All visitors to the building are searched and interrogated. The government has also announced audits of the two legal centers used by the KMWU and KCTU. The government crackdown stems from the union's participation in a July 2 general strike called by the KCTU and the KMWU's strike action in demand for national-level industrial collective bargaining.